Starting a new fitness program can be daunting, and one of the most used excuses is that you don’t have enough time. Good news though – a new study showed that even 10 minutes of fitness a day can improve your cardiovascular fitness. Need more motivation? Then read on about Cliff Young, a truly inspirational athlete. Trust us, after learning about his exercise feat, 10 minutes a day will seem like nothing! Every year Australia hosts a 543.7 miles endurance race that begins in Sydney and ends in Melbourne. This ultra-marathon is arguably one of the toughest races ever conceived, and typically draws world-class athletes in their 20s and early-30s. 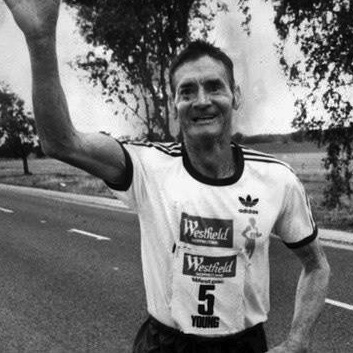 So when 61-year-old Cliff Young showed up to the 1983 Westfield Sydney to Melbourne Ultra-Marathon in overalls and gumboots everyone thought he was simply a spectator – until he picked up his race number. Despite Cliff’s confidence, many feared that the old farmer would suffer serious injury or even death; so when the race started no one was surprised when his competition soon left him behind. The crowds were even more dubious about the likelihood of Cliff’s success when they realized he ‘ran’ at slow, loping pace that looked more like a shuffle. When the professional athletes made camp that first night they had put tens of miles between themselves and Cliff, and went to bed exhausted having pushed themselves all day. But while the ultra-marathoners slept, Cliff Young continued to shuffle along. Turns out, when Cliff said he ran sheep for two to three days, he meant he did it without sleeping. Using this ‘tortoise-and-the-hare’ approach, Cliff took five days, fifteen hours, and four minutes to complete the race; making him the first competitor to cross the finish line in Melbourne. Not only had he surpassed all the young, elite-athletes – he had trimmed almost two days off the record for any previous run between Sydney and Melbourne! Cliff became a sensation over-night; having won the hearts of Australian’s and runners everywhere. His story became even more legendary when, claiming to be unaware that there was a $10,000 prize for the winner, Cliff deemed that the other racers were just as deserving and divided the winnings among them.